Just add sugar and water. 6 lbs of delicious homemade marmalade in just 30 minutes. 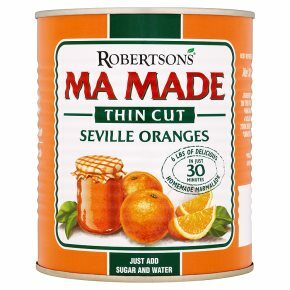 Note: Small white specks may be seen in the contents of this can, these are natural deposits of Seville Bitter Oranges and will dissolve on boiling. 1. Empty contents into a large 8pt (4.5 ltrs) saucepan. Add 3/4 pint (425ml) of water using the measure mark on the side of can. 2. Stir in 4lbs of sugar (1.8kg). Bring to the boil stirring continuously with a wooden spoon. 3. Reduce heat, maintain boil for further 15 mins, stir occasionally. Add a knob of butter during boiling to disperse foam. 4. Test for setting - remove from heat, put 1/2 teaspoon of marmalade onto cold saucer and put in a cool place. Test after 2 minutes by drawing a finger over the surface. If it wrinkles, setting point has been reached. If not, reboil for a few minutes. Test again. 5. Stand for further 2-3 minutes before pouring into warmed jars. If peel floats, stir contents of each jar. 6. Cover each jar with screw cap, parchment or film.